Hanoi (VNA) – Chairman of the Vietnam-Japan Friendship Parliamentarians’ Group Pham Minh Chinh proposed increasing exchanges between Vietnamese and Japanese young legislators at a reception for a delegation from the Youth Division of Japan’s Liberal Democratic Party led by its head Keisuke Suzuki in Hanoi on August 22. Chinh also suggested organising activities to promote cooperation in economy, investment and trade, as well as encourage more Japanese businesses to invest in Vietnam in the fields of support industry, manufacturing, energy, and hi-tech agriculture. He expressed his pleasure with the strong, comprehensive and intensive development of the extensive strategic partnership between Vietnam and Japan for peace and prosperity in Asia. He affirmed that Vietnam always considers Japan one of the top priorities in its foreign policy. 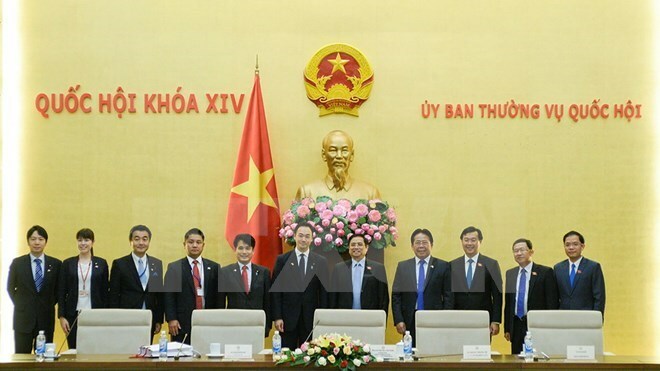 Chinh thanked the Japanese Government for providing official development assistance (ODA) for Vietnam to boost socio-economic development, reduce poverty, cope with climate change and develop infrastructure, energy and agriculture. For his part, Keisuke Suzuki said 2017 was a busy year for the two countries with a series of visits by their leaders. Among those were the Vietnam trips by the Japanese Emperor and Empress and Prime Minister Shinzo Abe, and most recently the visit to Japan by Prime Minister Nguyen Xuan Phuc, which created new developments for the bilateral relations. He called on Vietnam and Japan to enhance multi-faceted cooperation, particularly in economy, for the benefits of their people.